1) The role of Republican women in second wave feminism. 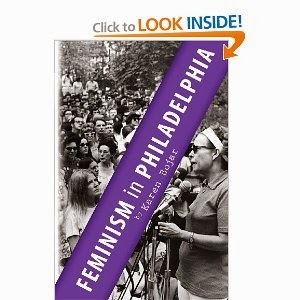 Feminism in Philadelphia contains a chapter on Ernesta Ballard, founder of Philadelphia NOW, in some ways an atypical NOW member--wealthy, Republican, Wasp elite background, but a passionately committed feminist. Ballard certainly deserves a full length biography, and there is definitely room for a study of the role of women like her in second wave feminism. 3) A comprehensive analysis of early 70's grassroots feminism and lesbian rights. Anti-lesbian feelings have been associated with NOW in its early years, thanks to founder Betty Friedan's much publicized reference to lesbians as the "Lavender Menace." In Philadelphia and in PA such attitudes appear to have been largely confined to Friedan. Philadelphia NOW passed a motion censuring Friedan and made history as the first NOW chapter in the country to elect an open lesbian as chapter president. When we have more regional histories, we will know to what extent the pattern in Philadelphia holds across the board. This is a book I would really like to read. 4) The Socialist Workers Party's campaign to take over the feminist movement. Political scientist Jo Freeman documents that the SWP and its youth movement, the Young Socialist Alliance (YSA) had deliberately targeted the feminist movement as early as the late 1960's and early 1970's. The SWP's ultimately unsuccessful campaign is interesting not just because of the havoc they caused (at least in some places) but because of the ideological challenges they posed, especially within NOW, a prime target for SWP take-over. NOW from its earliest days claimed that feminists of all political persuasions could find a home in NOW. Socialist feminists who entered NOW in the mid-1970's, many of whom were abandoning the then disintegrating New Left, challenged the idea that feminist beliefs trumped over-all political ideology. Philadelphia feminists focused on the disruption and didn't really address the ideological challenges. I explored how this unfolded on the national level and in Philadelphia but it was happening all-over the country. I would love to read a book about how this all played out in different regions of the country. Despite the efforts of individual Black and Latina and Asian women to influence their mostly White organizations, and their standing up at conferences to present their points of view, it was not until a significant literature by women of color appeared that the larger feminist movement began to learn significantly from those differences and be transformed. It was too painful for each Black woman individually to have to teach the White feminists in her organization about the differences in their experiences. But through the written word, which can teach many at once, and through the controversies and understandings generated when people talk about what they have read, the movement… is now beginning to absorb, confront, and be transformed by these new insights. 7) A Biography of Eleanor Smeal. At the readings/discussions I’ve held for I ask groups which leaders they associate with second wave feminism; usually only two names come up--Gloria Steinem and Betty Friedan. After having read mountains of archival material on NOW in the 1970's, it's clear to me that Eleanor Smeal (the founder of Pennsylvania NOW and later president of national NOW) was the organizational genius behind NOW in the 1970's. Smeal brought a political scientist's understanding of the political system and the possibilities it afforded for social change; this was to have a dramatic impact on the future of NOW and on the feminist movement. Smeal was both a visionary leader and skilled in the nuts and bolts of building an organization--a highly unusual combination. If someone has written these books and I somehow missed them, please let me know! Feminism in Philadelphia is now available in a paperback and in a kindle edition.